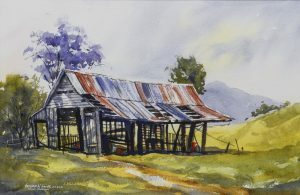 Graham is an established artist working in several mediums and is a member of the Royal Queensland Art Society (Brisbane). He has worked in oils, acrylics, pastels, watercolours and mixed media since 1966. His main oeuvre is landscapes and seascapes but in the 2017 Doug Moran National Portrait Prize his oil painting of “Silver Steve”, a human statue in Queen St Mall was one of 200 semi finalists out of 1200 entries Australia wide. Out of 453 art awards he has received 164 First Prizes including 61 Acquisitive awards. His works are predominantly vignettes of life, usually from the many countries he has visited over the course of his career. Graham likes to paint his work on site and then return to his studio and develop the studies into much larger works. 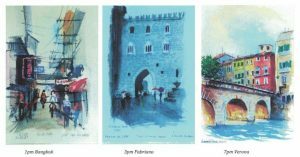 Graham will be tutoring a two day workshop on May 18-19 2019 doing watercolour landscapes and streetscapes. He will be encouraging his students to bring along their own subject matter on day two, however he will also be demonstrating if students wish to follow along. Bookings taken through Wide Bay Gallery. Please phone 07 41221858 or email widebaygallery.qld@gmail.com to make your booking.